I organize everything associated with my radio show in one iTunes Playlist Folder titled The Lunchbox. Within The Lunchbox I get a little creative to sort things for my needs because, to the best of my knowledge, it isn’t currently possible to sort Playlists by any other method than alphabetically. 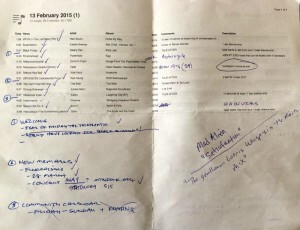 The post that follows explains how I manage playlists — including Playlist Folders — to create my show each week, keep track of previous programs, track which music has or hasn’t been played (read: vetted for language), and even print notes and cues for myself to use during the show. The image at right is an actual screen grab from my iTunes, and I will walk through it and try to explain the method to my madness. I use a combination of Playlist Folders, Playlists and Smart Playlists to create, manage, and organize The Lunchbox. This post will deal with Playlists and Playlist Folders. I will write a separate post for Smart Playlists. Playlist Folders are similar to folders on your computer. They help you organize similar information into a collection. In iTunes, you go to the File > New menu and select Playlist Folder, and then name it. In the first example (Figure 1) one can see that I use nested folders to help organize my shows. At the time of this writing, I am working on multiple programs. I will be out of town for two consecutive weeks and I will be providing my colleagues with music for them to play when they sit in for me. The dates with (AWAY) next to them will help me identify music that was played when I was not in the studio. I am not concerned about the sorting order of the ACTIVE folder as it is more fluid, and usually has a single folder for the current show. 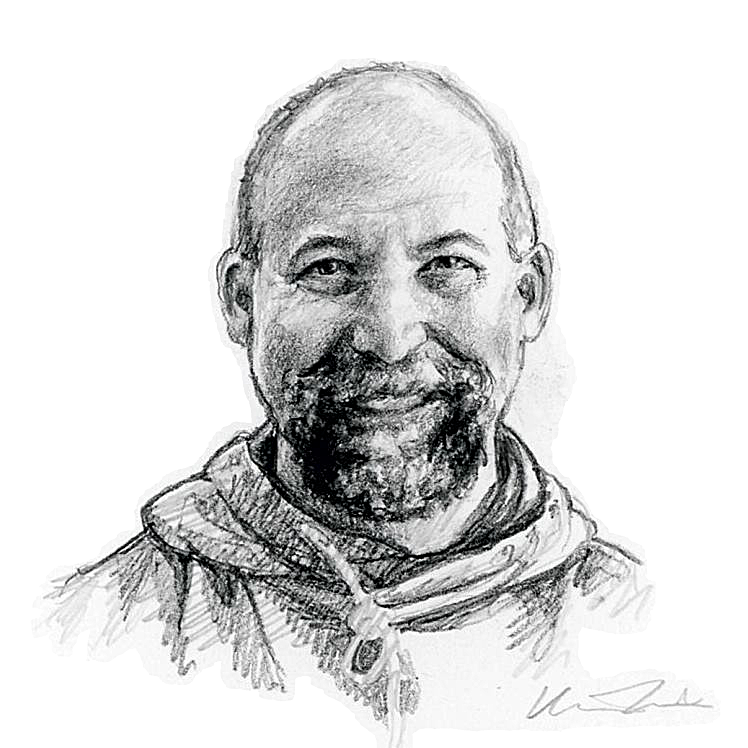 For the purpose of this instructional post, I am working on the program with a Playlist Folder titled 20 February 2015. Note that nested within the Playlist Folder are three regular Playlists — as opposed to Smart Playlists. The first two Playlists correspond to each hour of the 2-hour The Lunchbox. In each of the hourly sets I manage the songs play order and include my own station IDs, sponsor IDs, and any “carts” I may have created. Each week I create a new Playlist for the next show by duplicating the previous weeks’ playlists and moving those to the new Playlist Folder. 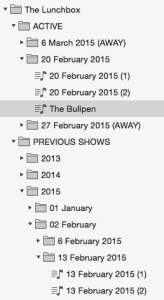 At this point in the process I also move The Bullpen to the next program dated folder. The Bullpen is a catch-all for music that I want to be able to find again if I need to add or cut songs. 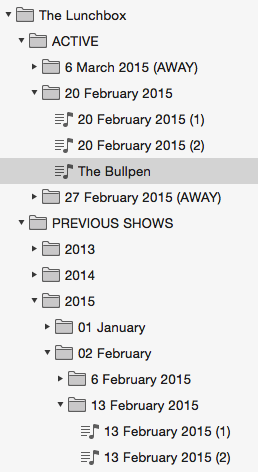 The Bullpen is a collection of music that I am keen to get into the show soon, and don’t want to lose track of in the full library. If I am very sure I want a song for the next week’s show, I will create the folder for the next show, create the hourly playlists, and add the song to one of them. If a developing Playlist has too much music, I move a few songs to The Bullpen for consideration for a later show. If a Playlist is short, I can sort The Bullpen by song length (as it is in Figure 2) and find something that fits the show as well as the time. I usually try to have at least 49 minutes of music in each hour of the program. If I end up talking too much (laugh it up) I can decide on the fly in the studio on my iPad which song(s) to not play. In the studio I will make a note on my printed Playlists and later make sure that the un-played song(s) are not included in the Playlist as having been played, and make sure to return the un-played to The Bullpen. Figures 3 displays a completed Playlist, but if I was still working on the show, I would drag and drop songs to change the order. It also allows me to also drag and drop between the first hour and the second hour if something doesn’t fit. Note the first song for the first hour is a combination of the ID that states the information at the top of the hour that the FCC requires, and my show’s theme music. There is a corresponding one to start the second hour that is only the FCC information. The song with [CART] in front of it is the audio I created to precede my weekly Friday Five bit. The item with [SPONSOR] in its Name is the audio I created for my show’s sponsor. These can also be used as breaks in the programming should one wish. To the right of all the information are my programming notes. I use the Comments field in iTunes for weekly cues such as “TALK AFTER” to remind me where the breaks are. Sometimes I will use tools in iTunes to cut a song short, and I will make comments such as seen in for Driving Sideways (> at 3:44) to remind me that the song will end at 3:44 rather than the song’s original length of 3:47. This is helpful when trying to make sure segues between songs are smooth or creative, and I make notes so I am not caught off guard, or in case I want to put the song back to its original length. The Description field can hold lots of information, but lately I have been using it for notes about the song’s feel, pace, how it starts or ends (fade vs abrupt), whether it is an instrumental, etc. Knowing whether a song has 5 seconds or 0 seconds at the end is useful for building Playlists. Songs that have no time at the end to press pause are better suited for middles of sets, while songs that start abruptly are better for beginnings of sets. Songs with long fades are good for the end of sets too as they allow for one to speak over the ending. I also keep a record of all of the previous programs I have done, and this is the Previous shows’ folder (Figure 1). A bit of an overkill, but when I am doing a themed show it helps me look back on what I may or may not have played the previous years. For example, last week was Valentine’s Day and I was able to look back on last year’s show to see what I played. As a volunteer DJ with other (volunteer) duties at the station — as well as a busy life outside of the station — keeping iTunes organized this way saves me time. Nearly all of the ways I organize iTunes for my radio show are designed to help me save time so that the show doesn’t become a chore and remains a very fun hobby. The PREVIOUS SHOWS Playlist Folder (Figure 1) is my archives. Each show is moved to its respective sub-folder in Previous shows. I do this as soon as I duplicate the Playlist for the next show, and after I have added the Grouping information. You can see (Figure 1) that PREVIOUS SHOWS has sub-folders for years (2013, 2014, 2015), and then for each month of the year — with the month’s number in front for sorting purposes. Within each month’s sub-folder are the shows from that month. I normally prefer to avoid printing anything to paper, but over the years I have found a couple of good reasons to have a printed playlist handy. The first reason is that the printed list in front of me gives me the ability to write notes during the show. 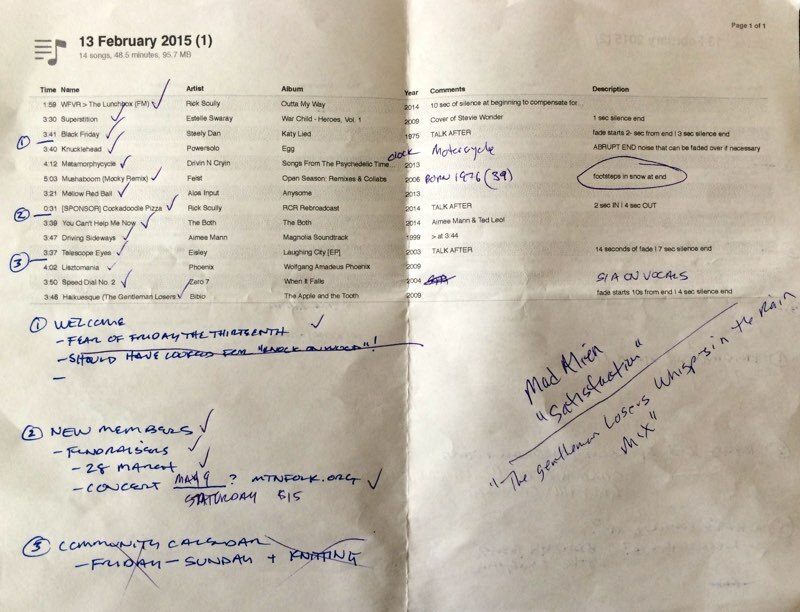 I use the paper version to tick off the songs as they play, write notes to myself for upcoming breaks, as well as to note songs that may not have been played despite being in the list. If someone calls the station while I am on the air, I write down their name and or their request. To save paper, and make things easier, I print on both sides of 1 piece of paper each week. In order to force the printed playlist to look like the one on my screen (Figure 3) one clicks inside the body of the playlist where the songs are listed. Then select File > Print and when prompted select the radio button next to “Song list” and choose Custom from the Themes dropdown menu. Then click Print, and when your printer window opens, choose Print again. Please note the on-screen messages in the windows that open during this process for hints on page orientation, etc. Note: The printing method described in the previous paragraph will print all of the columns visible in the iTunes Playlist. The more fields you print, the smaller the printed text will be. Personally I print exactly what is seen in Figure 3. ← You Gave It How Many Stars?